The Slackcountry’s name describes it perfectly: this is the perfect board for lift-accessed powder stashes. Rule the powder and have an awesome time getting there. Most powder boards require you to give up significant performance in-bounds. Not this ride. The Slackcountry is equally at home carving up your local mountain and raging the steep and deep of the backcountry. Dare I say “quiver killer”? The 2011 version takes last year’s rockered twin-tip powder design and refines it to make the board even better. The board still has the minor 3/4 inch setback (with markers for 0″ setback if that’s your style) and rocker from bindings out. 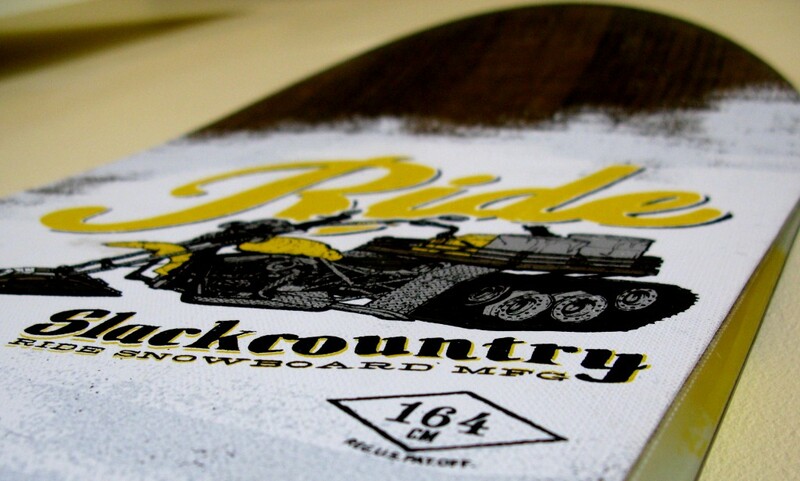 Ride has kept the board’s urethane sidewalls to absorb chatter and keep edge pressure on the pack. The new model adds an ultralight base, a clear hemp top sheet, and a new 157 cm option. Our thoughts: Ride hooked me up with a 164 Slackcountry to ride for several days in varied conditions. 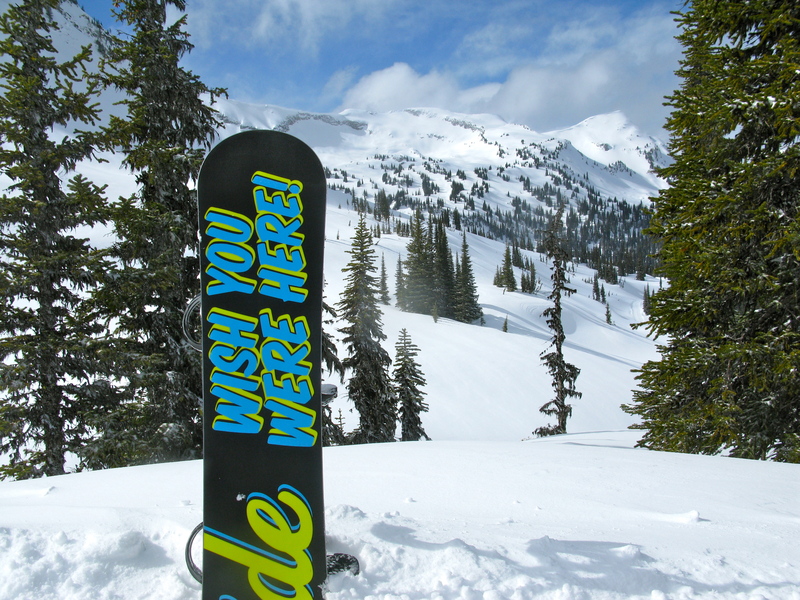 I took the board out for several days at local Washington resorts, including a fast-charging bluebird groomer day and a powder day at Crystal Mountain and a spring slush-fest at Stevens Pass. After getting to see how it did riding lift-accessed slackcountry, I took it up to British Columbia for a cat-accessed backcountry trip with Monashee Powder Cats to see how it did in non-stop deep powder. I rode the Slackcountry on ice and hardpack, I carved up wide-open untracked bowls and snaked through trees, I bombed chutes and dropped cliffs. No matter where I was or what I was riding, I had an absolutely awesome time on the Slackcountry. They’ve nailed it with the rocker on this board. The float is fantastic. Because the board isn’t tapered or set back, the tail doesn’t settle on it’s own. Fortunately, it only took the slightest shift toward my back foot to pop the nose up and get some float. If I didn’t keep my weight shifted back, the nose would dive, but because it rocked back so easily, rear leg burn was never an issue. The Slackcountry doesn’t have the non-stop float of a heavily tapered board, but for what you gain with it (in-bounds awesomeness), I think it’s a fair trade. The almost-centered stance and twin shape let me do something I rarely attempt on a heavily tapered board: ride powder switch. Which I did a LOT. And it was tons of fun. Tons. The rocker also made buttering and wheelie-ing much easier in powder. I found myself playing around on this board much more than I ever had before. There is a downside to the heavily rockered shape of this board: landings can be squirrelly. Because of the ease with which this board pops up in front of you (to give it float), I found it really wanted to zip out from under me on big landings. If I came down centered, this wasn’t a problem, but if my weight was back even a tiny bit, I really had to shift forward as fast as I could if I wanted to stick a landing. The biggest surprise the Slackcountry had in store for me was how well it carves on pack. It’s a fairly soft board designed for powder, so I didn’t expect much on groomers. Turns out it carves phenomenally well. Groomers are a blast on this board. I think the secret is in the urethane side walls – even though the board is fairly soft, they keep the edge in contact with the snow. I only had issues at very high speeds, where the edging couldn’t keep up and the board would begin to feel a bit unstable. During my first day at Monashee, our guide pointed me toward a perfect chute between two cliff bands. It was about 100 feet long, 10 feet wide, and very steep. I’ll admit that I was a little nervous as I dropped in at the top. Losing my edge would have resulted in quite a tumble. About two turns into the chute, I realized that on the Slackcountry, I had nothing to worry about. This is where the board really excelled. The rocker gets the tip and tail out of the way – the board flipped edge-to-edge effortlessly, but once on edge, it gripped the snow with a Vulcan mind-board connection. As I dropped out the bottom of the chute, I had a massive ear-to-ear grin and I was hooked on this awesome board. Camber: The Slackcountry features Ride’s “Highrize Rocker” which is a reverse camber design where the board is flat between your feet for stability and edge control, and rockered from the bindings to the tip and tail giving the board lots of lift and float. Size and options: The 2010 Ride Slackcountry is available in a 157, 161, 164, and 168. I first came across the Ride Slackcountry last March during one of those epic days at Mt. Hood Meadows. I rode up the lift out of Heather Canyon with a guy one a sparkly board with a huge grin on his face. I asked him about his board and explained that a friend of a friend knows a guy who reps for Ride and he’d gotten to take this board out for the day. “I’m definitely going to be riding this board next season,” he told me. Ride takes a very different approach to powder riding with the Slackcountry than tapered boards like the Fish or the Snow Mullet. Rather than essentially cutting off the tail of the board causing the back of the board to sink down, the Slackcountry relies on a minor 3/4 inch setback and massive rocker. This means you can lean back effortlessly, lifting the nose of the board up to get the required powder float. The more traditional twin shape means this board will still be a blast to ride in variable conditions and will keep the freeride feel in the steep and deep. Our thoughts: This is a beautiful board. Ride’s membrain top sheet allows them to make the board very light and give it a holographic sparkle that you won’t want to cover in stickers. I tend to prefer the surfy feel of a tapered board, but for those of you looking for more of a freestyle powder ride, the Slackcountry is a fantastic option. Size and options: The 2010 Ride Slackcountry is available in a 161, 164, and 168. Splitboarder? Check out the most active splitboard forum on the web at www.splitboard.com. It rules.